Best for normal to combination skin. Rapidly absorbed, and deeply hydrating, firms and softens the skin, and balances oily and dry areas of the face. The deep moisture fluid nourishes with natural plant vitamins, minerals, bio-flavonoids and other biologically active substances. Up to 24 hour intensive hydration with invigorating Northern Raspberry and Red Clover extracts. Boosts moisture instantly and throughout the day. Balances oily and dry areas of the skin. Skin looks suppler and firmer. Aqua Rosa Damascena (Rose) Flower Water* Alcohol Glycerin*** Simmondsia Chinensis (Jojoba) Seed Oil* Helianthus Annuus (Sunflower) Seed Oil* Trifolium Pratense (Red Clover) Flower Extract* Rubus Idaeus (Raspberry) Fruit Extract* Cetearyl Alcohol Persea Gratissima (Avocado) Oil* Dicaprylyl Carbonate Cetearyl Glucoside Tilia Cordata (Linden) Flower Extract* Artemisia Vulgaris (Mugwort) Extract* Lecithin Betaine Stearic Acid Palmitic Acid CI 77891 (Titanium Dioxide)**** Tocopherol Ascorbyl Palmitate Xanthan Gum Sodium Hyaluronate Sodium Phytate CI 77019 (Mica)**** Lactic Acid Aroma** Citral** Limonene** Linalool**. * ingredients issued from Organic Agriculture; **natural essential oils; *** inorganic substances and/or pure mineral pigments. Natural and Organic cosmetic certified by ECOCERT SAS B.P. 47 F-32600 according to ECOCERT Standards. Apply in the morning to cleansed and toned face and neck. 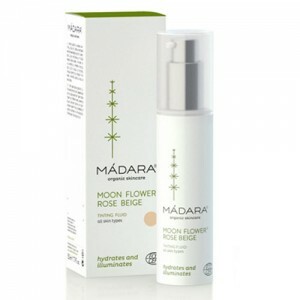 For moisturizing in the evening choose MADARA regenerating night cream.